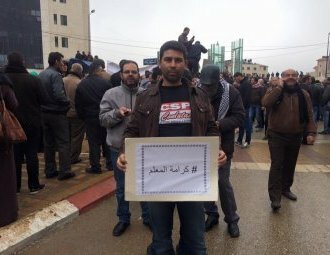 Workers’ organizations affiliated to the CSP-Conlutas express their solidarity with the historical strike of Palestinian teachers, which began on 10 February. The strike has being held for ensuring labor rights and against the Palestinian Authority policies (ANP), which maintains security cooperation with Israel. Despite the repression, which resulted in temporary prisons, the strike strengthens and gets support. Several demonstrations have gathered thousands in the occupied Palestinian streets. The representation of the CSP-Conlutas was present at one of them, on last 23th. The mobilization requires implementation of a labor agreement signed in 2013 and also faces with the labor union, which failed to defend the rights and interests of teachers, losing legitimacy with the people they represent. The average salary of a Palestinian teacher does not exceed 3000 shekels (equivalent to R $ 3,040.00) per month. To get an idea, the average monthly expenditure on rent in Ramallah is around 1,370 shekels, almost half the salary of a teacher. The arrests denounce the unfortunate role of ANP in repressing struggle of workers and Palestinian youth, either by their basic rights such as better wages and benefits, either against the State of Israel. This has been the center of the ANP role, which intensifies while intifada (popular uprising) is on the way. These workers keep on fighting. In solidarity, we demand dignity to Palestinian teachers and the end of the agreements between PA and Israel.